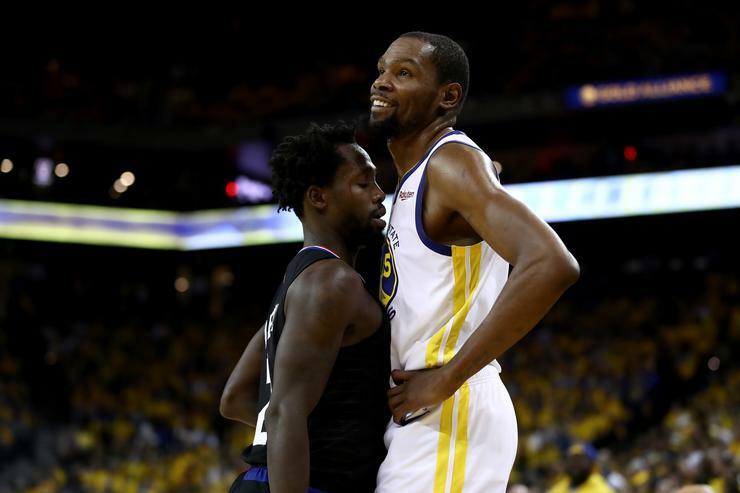 Home>Sports> Kevin Durant's Troll, Patrick Beverley, Says There Is "No Beef"
Earlier today, we reported how Patrick Beverley has been a pain in Kevin Durant's side during the Los Angeles Clippers series against the Golden State Warriors. Durant and Beverley were ejected in game one and in game two, Durant continued to get hounded by Beverley. When asked about his approach to the game, Beverley had a diplomatic answer. Now, Beverley has provided a further update on his relationship with Durant, courtesy of TMZ. When asked if there is bad blood between the two, Beverley said there isn't. "I don't got no beef with anybody," Beverley explained. "It's all fun, man. Just two good teams, two good players battling." SPORTS Kevin Durant's Troll, Patrick Beverley, Says There Is "No Beef"